Welcome to my Weekly Writing Wrap-Up for this week. Top Writing Day: My top writing day was Wednesday with 606 words. What I Worked On: I worked on Hunger Games fanfiction and my novel. The Good News: I did write a little! The Bad News: I had a cold this week which is why I didn’t write very much. Lesson Learned: I caught a cold and have been feeling awful pretty much the whole week. I did write a little when I was feeling up to it, but I didn’t get much done. My lesson learned is that sometimes writing isn’t happening that week and there’s nothing to be done about it. 🙂 Hopefully I will be back to writing soon! Goal for Next Week: My goal is to finish editing this chapter of Snow and write at least 1000 words in my novel. Tay can be a guy or a girl’s name. It’s the name of the longest river in Scotland, and it can also be a nickname for the name Taylor. I’m using it as a girl’s name, and it’s Tay’s full name. I found the name just browsing my favorite name site, and as soon as I heard it, I knew it was perfect for my Tay. She’s protective and tough, but with a softer side that she doesn’t often show. Today’s quote comes from Jack M. Bickham, author of Baker’s Hawk. Whenever I’m out, I always look around for ideas and listen to conversations for dialogue inspiration. For any ideas that are too good to pass up, I use an app on my phone called “Writer.” It’s free and creates a basic text document I use to write down ideas. On NaNoWriMo’s website, there’s an off-topic thread just for Christian Teens to post on. Even though NaNo has been over for 2 months, I still post on the thread regularly, and I’ve become close friends with the other teens there. 🙂 One day, we were talking about our different personality types, and we discovered that out of the 15 or so people who post regularly, only 2 people are extroverted. The rest of us are all introverted, including myself. We also compared our Myers-Briggs personality types, and my type is ISFP, which is the creative/artistic personality type. For those who may not have heard of the Myers-Briggs test, it’s a personality test that assigns people different letters for different personality traits. For example, I am a ISFP, which means I am introverted (I) instead of extroverted (E), sensing (S) rather than intuitive (N), feeling (F) rather than thinking (T), and finally, perceiving (P) rather than judging (J). This link explains it really well. After the conversation on the thread, I was curious about my characters. What were their personalities? It also made me wonder about us as writers. Do we tend to create one personality type more than another? Do we create personalities based on who we are or who we want to be? So, I decided to take each of my main characters through the Myers-Briggs personality test. I was also curious to see, as an ISFP, if I wrote one type over another. I used this test for my characters as it was simpler and quicker than the more in-depth one I took for myself. Also, the little labels by each of the types came from this website. The test really helped me to learn a ton about my characters. The character who surprised me the most was Snow. I guessed she was introverted, but I would have never guessed she was the same personality as me. The description of Finley’s personality as “The Supervisor” made me laugh, as that is exactly what he is! He’s Snow’s trainer, and his job is to supervise her. Tay’s description is also dead on, as she is overprotective of her little brother. The type I write most often is a tie between ISFP, which is my personality type, and ESFP, which is the extroverted version of my type. Most of my female characters are introverted (with the exception of Bravery), and my guy characters are extroverted (with the exception of Daxton). Have you ever done this for your characters? If so, what was their personality type? What is yours? Comment below and let me know! Top Writing Day: My top writing day was Thursday with 1,308 words. What I Worked On: I worked on Hunger Games fanfiction, my novel, and editing Snow. The Good News: I made my goal in my novel! The Bad News: I didn’t finish editing my Snow chapter (but I did work on it!). Lesson Learned: I was working on a scene for my novel, and it just wasn’t going the way I wanted it to. In fact it kept dragging on and on and just wouldn’t end. So, I abruptly ended it (by ending the conversation and sending my main character to bed) and moved on to the next scene. My lesson learned is sometimes the scene just really needs to stop! If you’d like to share your weekly wrap-up, go ahead and post it in the comments below! Imagine this: It’s Ancient Greece and you’re at a festival. Two figures come out of the crowd, and the crowd forms a circle around them. The two men draw knives and begin to circle each other, blades clashing as they dance and spar with one another. Suddenly, you see one of the figures stab at the other, and he falls to the ground, blood pouring out of his wound. You gasp in shock, as you see the other fighter dance around his fallen enemy’s body. The other fighter looks down, and as if realizing what he’s done, all the joy drains out of the man’s face. He drops to his knees and holds the dagger above his chest, about to plunge it in. You are pushed forward along with the rest of the crowd, as they try to get to the man, hoping to prevent him from killing himself. As you are shoved closer and closer to the center of the circle, the laughing and the shouts begin to ring out. “It’s fake! It was just a show!” You didn’t realize it at the time, but you just witnessed a pyrrhichios. A pyrrhichios is a Greek war dance. It’s thought to have originated from the days of the Trojan war when Achilles first saw the body of his dead friend Patroclus. Achilles expressed his grief through this intense dance. There’s also the belief that the dance could have come from Pyrrhus, Achilles’s son, who danced it around the funeral pyre of his enemy Eurypylus. The pyrrhichios were popular with the Spartans who taught this dance to their children at a very young age as light war training. My story of the dance is based on a description from Xenophon, a Greek historian, who tells of a pyrrhichios in his work Anabasis. I managed to find a video of someone performing this dance. It’s very cool! This quote is from Thomas Mallon, author of Henry and Clara. Writer’s block is never fun to deal with, whether you believe it’s invented or not, and Thomas Mallon has some good advice. You all know how much I love to write fanfiction. I’ve posted a few of my fanfictions for Owl City, Doctor Who, and The Hobbit on my blog. Well, I also enjoy drawing my favorite characters! Today I’m sharing a few of my fan drawings! This is the Eleventh Doctor played by Matt Smith from the episode A Nightmare in Silver. In this episode, the Doctor is in the process of being turned into a Cyberman, a human in a robotic suit with no emotions. 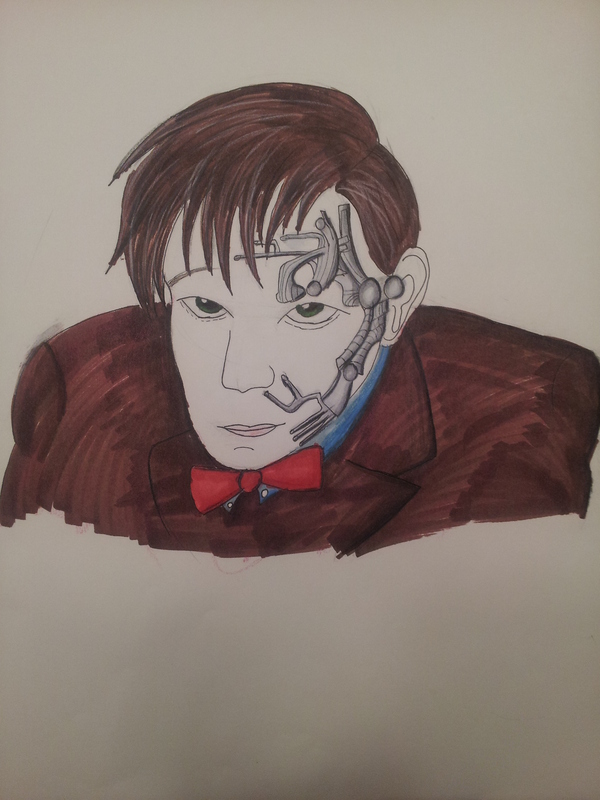 I loved the way he looked with all the wires on his face and his creepy cyberman grin, so I drew it! This is Rose Tyler as the Bad Wolf/The Moment from The Day of the Doctor, Doctor Who’s 50th anniversary special. 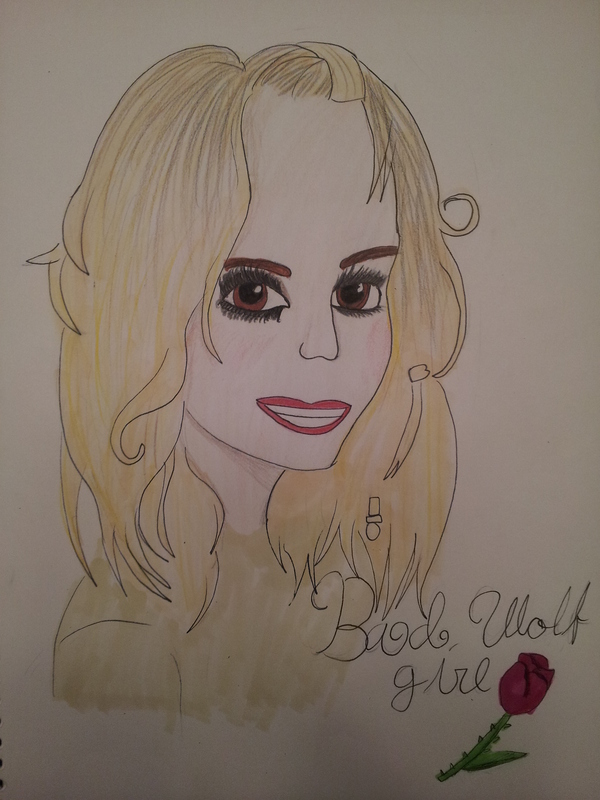 Rose is one of my favorite companions, and I loved her as the Bad Wolf. 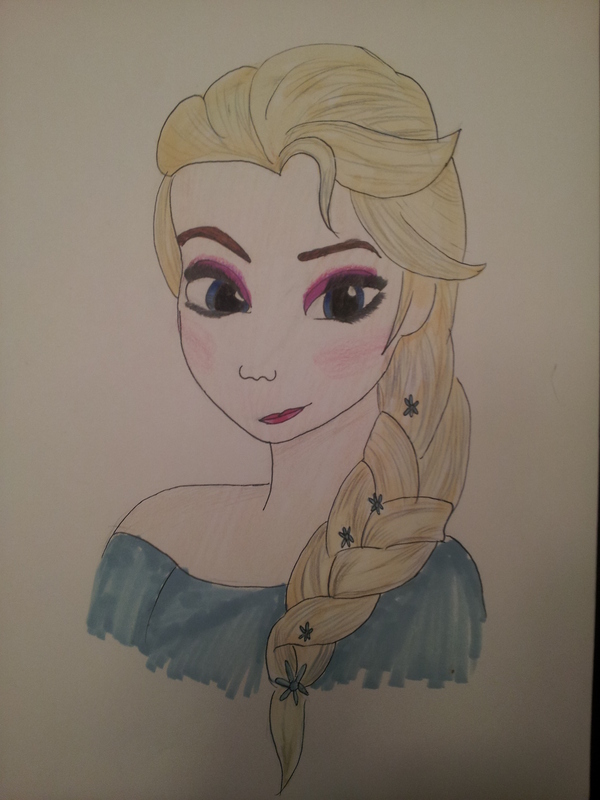 So, maybe I’m a little older than the intended audience for Disney’s Frozen, but hey, I like the music, and Elsa is pretty awesome. 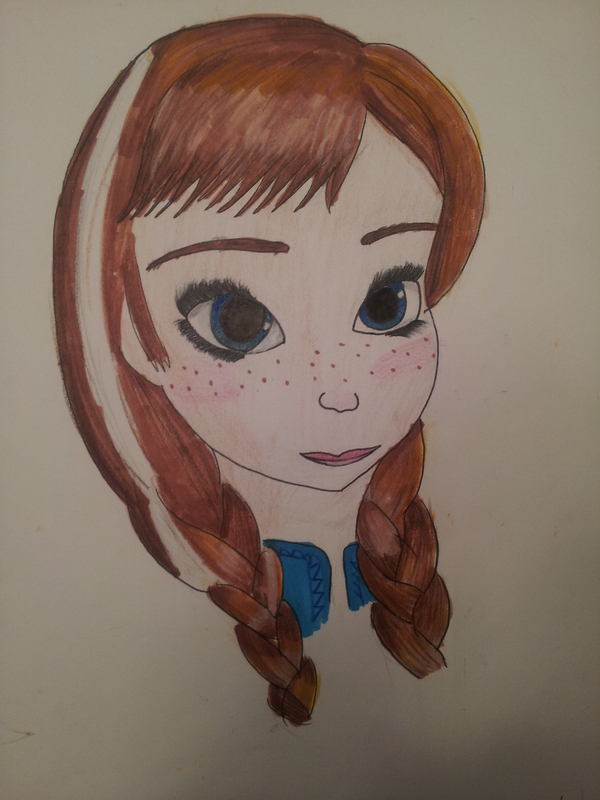 I love drawing her and her sister, Anna, so I did matching drawings of them. I mentioned a few months ago that I read The Hunger Games books and watched the movies for the first time. 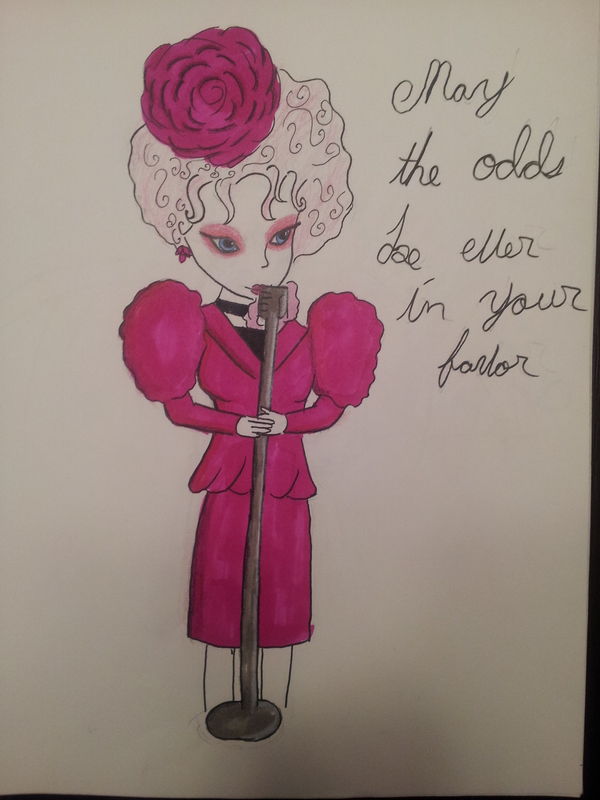 For my first Hunger Games fan drawing, I wanted to do a cartoon version of Effie. I never get to use bright colors like she wears or draw in that heavy of makeup, so this was really fun to color in! My very favorite character from The Hunger Games is Finnick Odair. 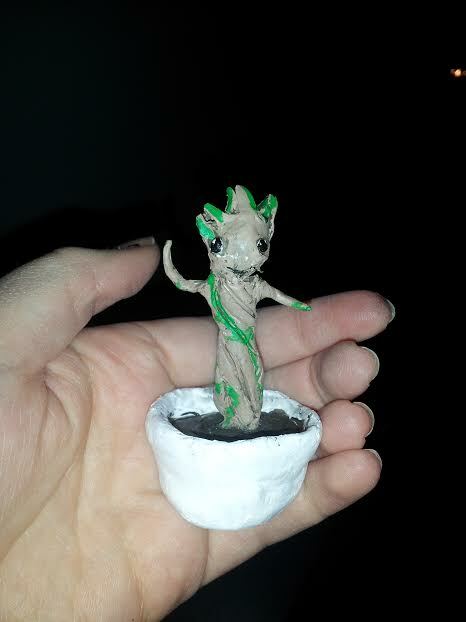 He’s a complicated character, and through most of the books, I just wanted to make everything better for him! I’m still not over the ending. 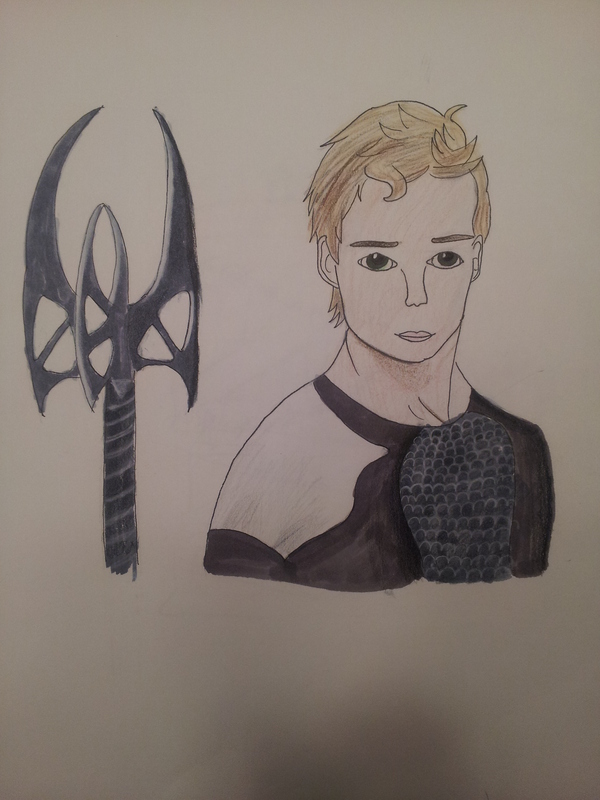 Anyway, here’s my drawing of him from Catching Fire! Do you do fanart or write fanfiction? Who are your favorite characters? Comment below and let me know! Top Writing Day: My top writing day was Wednesday with 1,236 words. The Good News: I’ve gotten a lot of work done on my novel. The Bad News: I haven’t worked a lot on Snow. Lesson Learned: I’ve been roleplaying with my friends from the NaNoWriMo forums lately using two new characters of mine. Not only has it been a ton of fun, but I’ve gotten more character development done in four days than I would have in months. My lesson learned is that roleplaying is a great way to develop characters! Goal for Next Week: My goal is to finish editing this chapter of Snow and write at least 1000 words in my novel this week. Disclaimer: If you haven’t seen the movie yet, don’t read beyond this point! There are spoilers below. 1. Legolas riding on the legs of that bat creature – come on, that was awesome! 2. Thranduil was extra awesome in this movie. And so was his elk/reindeer/moose thing. 3. Bilbo’s line about stealing the keys from Thranduil’s guard was very funny. 4. The Strider scene! I fangirled so hard at the mention of his name. It was a clever connection. 5. “The Last Goodbye” song. I sobbed when that started playing. 6. Smaug’s lines to Bain and Bard in Laketown were chilling. 7. Thorin going mad was so well acted by Richard Armitage. I loved his character development, and I loved seeing the gold covered hall. 8. Thorin’s ending line was straight from the book. Kudos to Peter Jackson for leaving that in! 9. Three words for those who have read the book: Lobelia Sackville-Baggins. I’m so glad she got to have an appearance. 10. Galadriel fighting at Dol Guldur. She looked really cool. Don’t mess with Galadriel! 11. That ending with Bilbo and Gandalf. It was perfect. 1. Kili’s death. I still cried my heart out when I saw him die, but I HATED how he died with Tauriel. 2. The whole Kili/Tauriel romance was so unnecessary and unbelievable. 3. Fili deserved a better death scene. In fact he deserved more lines and screen time, too. 4. The deaths of Kili, Fili, and Thorin were expected, but disappointing. They should have died in battle next to one another like in the book instead of apart. 5. The amount of Alfred in the movie. Seriously, there seemed like there was a ton of him! So, what did you like about the movie? What didn’t you like? Comment below and let me know!